Nikki Giovanni is one of the most decorated poets of our time. She is the recipient of seven NAACP Image Awards, a National Book Award, a Caldecott Honor, a Coretta Scott King Award, and a Grammy nomination. She is the author of three New York Times bestsellers as well as many poetry collections for children and adults. You can visit her online at Nikki-Giovanni.com. 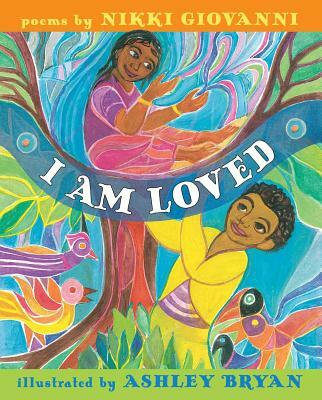 In this collection, poet Giovanni seeks to remind black children especially that they are loved. Giovanni carries the weight of the love that has sustained generations and united communities to her poems with amazing, succinct elegance. Standouts include "I Am a Mirror," opposite which Bryan centers a real inset mirror against a colorful background of vibrant shapes amid natural landscapes. "I reflect the strengths / Of my people / And for that alone / I am loved," concludes Giovanni's ode to black ancestry and intergenerational resilience. "No Heaven" takes another heartwarming approach sure to incite genuine embraces among readers. "How can there be / No Heaven / When tears comfort / When dreams caress / When you smile / at me." Recalling her earlier collection Hip Hop Speaks to Children (2008, illustrated by Kristen Balouch), Giovanni ends with the playful and reflective "Do the Rosa Parks," a rhythmic and moving song about the power of sitting down to stand up. Outkast vibes run through it, though some readers may wish for an instructional cue. Throughout, Bryan's bright tempera and watercolor paintings offer readers harmonious forms and flowing lines, smiling black children and adults arranged as if in tropically colored stained-glass windows. The two masters together deliver another powerful addition to their separate, award-winning catalogs. A small but mighty collection sure to remind readers that love, again, can prevail over all if given the chance. In 11 poems, a mix of new and previously published work, Giovanni celebrates open-ended and affirming love. Some invoke love directly (“I wrote a poem/ for you because/ you are/ my little boy,” begins the opening poem, “Because”), others obliquely: in “Quilts,” an old tablecloth seeks new life: “When I am frayed and stained and drizzled at the end/ Please someone cut a square and put me in a quilt/ That I might keep some child warm.” Newbery Honor–winner Bryan paints African-American men, women, and children in thick, swirling compositions suggestive of stained glass; he makes room for an embedded mirror to accompany a poem that addresses readers directly: “I reflect the strengths/ Of my people/ And for that alone/ I am loved.” A joyful and broad reflection of love’s many faces. A legendary pair presents a volume of verse worth remembering. Bryan’s recognizably vibrant, colorful, and moving illustrations accompany a selection of Giovanni’s poems (both new and previously published). The electric blue, sunny yellow, warm brown, bright purple, etc., of the front-cover illustration set the upbeat tone that Bryan maintains throughout (even in “A Song of a Blackbird,” a poem about death). While the topics range from dance to self-reflection to nature to friendship, each illustration affirms the beauty and worth of black and brown children. Several poems recall slavery and the civil rights movement, providing a historical source of strength and courage for contemporary readers. One poem, “I Am a Mirror,” is told from the first-person perspective of the mylar mirror attached to the facing page. The speaker travels back generationally, beginning with “I reflect the grace / Of my mother…” and going back to the great-grandfather and the ancestors, taking an attribute from each generation that results in a strong individual. The presentation can be viewed as an almost literal interpretation of Rudine Sims Bishop’s concept of a mirror book. An awe-inspiring compilation of poetry and art that will bring readers back again and again. This dynamic collection of verse thrums with musical language, exploring the interconnectedness between individuals and generations, humanity and nature. Pulsing through each brief poem is a leitmotif of love, and Bryan’s warm illustrations underscore the book’s comforting refrain. While a few poems are bittersweet, dealing with aging and loss, serene and contented elements emerge amid the wistfulness. Non-religious spirituality pervades Giovanni’s language with a reverence for nature, and for life itself, in simple words that will resonate with young and old. “No Heaven” questions “How can there be/No heaven/When rain falls/gently on the grass/When sunshine scampers/across my toes.” “Kidnap Poem” is especially metaphor-rich and overall lush, and the final poem, “Do the Rosa Parks” is perfect for reading to groups of young children, as it invites recitation and movement. Bryan’s bold illustrations reflect the energy of the verses, splashing rainbows of rich color across every page. The paintings highlight a particularly poignant line or illuminate wording that some young readers might find complex, thereby aiding their meaning-making process. Children will especially enjoy the mirror included beside the poem “I Am a Mirror,” a luminous verse that speaks of resilience. VERDICT A recommended addition to all picture book poetry collections, one that encourages children to embrace their personal histories and to love and be loved. A vibrant burst of positivity for readers of any age.